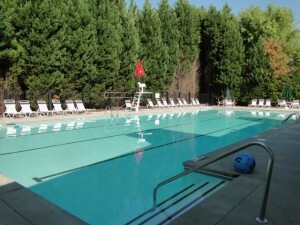 Ashford Chase is a swim/tennis neighborhood ideally located between Ashford Dunwoody Road and Chamblee Dunwoody Road in the heart of Dunwoody, in the 30338 zip code. 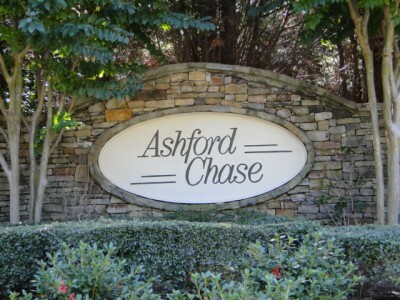 With easy access to Perimeter Mall, Dunwoody Village, GA 400, and I-285, Ashford Chase is a prime location. Here are the top 10 reasons we love Ashford Chase and the Dunwoody area. Ashford Chase Homeowners Association – Ashford Chase residents can stay up to date on information on their neighborhood and the surrounding Dunwoody community through an active homeowners association. 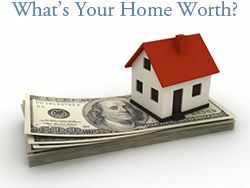 The Ashford Chase Homeowners Association has a website for visitors and a private, members only section for residents. They also have a Facebook page. Ashford Chase has annual neighborhood events such as the Ashford Chase Pumpkin Patch and Easter Egg Hunt. Pool, Clubhouse and Pavilion – At the entrance of the neighborhood pool, the fully equipped Clubhouse is available for neighborhood gatherings or private affairs. The lap swimming pool is a top spot in the summer. The pool offers open swim and lap swim. Take a break from the break from the sun in the community pavilion. Residents can eat lunch at the picnic table or grab a soda from the vending machine. Restrooms are also available at the pavilion. Location – Location just North of I-285, East of GA 400, commuters will love the easy access to Buckhead, Sandy Springs, Alpharetta, Buckhead, Vinings, and Midtown Atlanta. Less than a mile north, residents can enjoy the quaint downtown Dunwoody Village filled with local boutiques and restaurants or head west or south of Ashford Chase for an endless about of shopping and dining. See map of Ashford Chase. Tennis – Game, set, match! 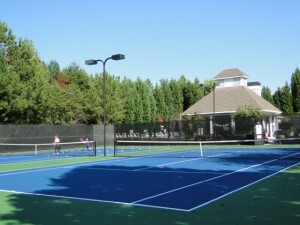 Residents love hitting the beautifully maintained, lighted tennis courts for a friendly tennis match. Playground and Picnic Area – Children in the Ashford Chase neighborhood love the over-sized playground. 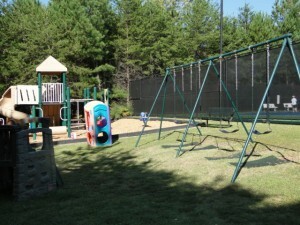 The playground includes swings, a smaller play set for toddlers and a large play set for the bigger kids. Take a pack lunch and enjoy the picnic area. Great Schools – For the 2011-2012 school year, Dunwoody Club Forest residents are zoned for Dunwoody Elementary School, Peachtree Middle School and Dunwoody High School. Annual Events – Dunwoody offers many annual events to bring the community together. Events include: Taste of Dunwoody, Wesleyan Artist Market, Dunwoody Lemonade Days, Dunwoody Art Festival, 4th of July Parade, Dunwoody Home Tour, Dunwoody Music Festival and Chili Cook-Off, Marist Holiday Traditions, and Light up Dunwoody. Dining – Perimeter Mall and surrounding area is home to Maggiano’s Little Italy, The Cheesecake Factory, Hudson Grill, Season’s 52, Twisted Taco and Eclipse Di Luna. J. Alexanders, McCormick & Schmick’s Seafood, P.F. Chang’s China Bistro, Brio Tuscan Grille, Chili’s, Twisted Taco can be found just south of Ashford Chase. In and around Dunwoody Village dine at Mellow Mushroom, The Dunwoody Tavern, Village Burger. Even more dining options can be found driving down Perimeter Center West. 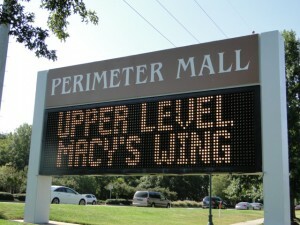 Stein Mart, Michael’s are all found at Perimeter Pointe. Just south of Ashford Chase residents take advantage of Walmart, Hobby Lobby, ULTA, DSW Shoes and Cost Plus World Market. Dunwoody Village – Built in the 1970s the Dunwoody Village is the heart of the Dunwoody. 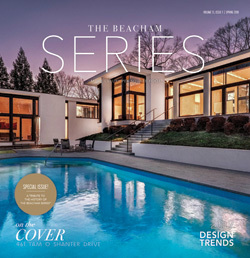 The Williamsburg-style architecture of Dunwoody Village showcases the quaintness of Dunwoody. It is home to a variety of businesses including Fresh Market, Dunwoody Prep, Mellow Mushroom, The Dunwoody Tavern, and Village Burger.